5-octave range. Rotary controls for pitch, volume, waveform, and brightness. Furniture-grade hardwoods. $539 Seen a lower price? 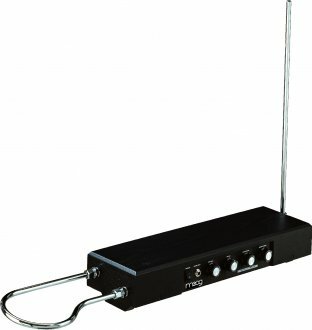 Authentic theremin sound, fun to play. This is the instrument that so intrigued Bob Moog that he has spent the last 50 years building the most influential electronic musical instruments in the world. This fully-built instrument is finished in a black, all wood cabinet. Additionally there is a professional model available - the Etherwave Pro. All Etherwaves ship with two video tutorials on one DVD: Clara Rockmore: the Greatest Theremin Virtuosa, and Mastering the Theremin, featuring Lydia Kavina. Just like electric guitars and many keyboards, theremins require amplification. While the Etherwave Theremin Amp is recommended, most keyboard amplifiers or PA systems should also be sufficient. Dr. Robert Moog started producing Theremins professionally at the age of 20, and his many years designing synthesizers, theremins, and other electronic music products have created an unparalleled body of work. The current incarnation of Moog Music started as Big Briar, the company founded by Dr. Moog in 1978. Big Briar became Moog Music in 2002 after Dr. Moog reacquired the Moog Music trademark. 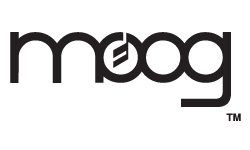 Moog Music is an Asheville, North Carolina-based company made up of musicians, business professionals, and technicians who work together to bring you some of the finest electronic music gear on today's market. Moog draws on a long tradition of analog design to produce USA made instruments with great sound, musician-friendly user interfaces, and rugged, good-looking classical enclosures. All Moog Music products carry a full one-year warranty against faulty parts or workmanship, in the absence of obvious neglect or abuse. Take care of it and they'll take care of you! - Power Input: receptacle for the special AC adapter that comes with the Etherwave. Available until 11 PM (EST) today. Mention special code 20M-TR3G when you call.